What Is the Anatomy of the Nail? What Are the Subtypes of Fungal Nail Infections? What Are Fungal Nail Infection Risk Factors? What Are Fungal Nail Infection Symptoms and Signs? How Do Health-Care Professionals Diagnose a Fungal Nail Infection? What Are Fungal Nail Infection Treatments? Are There Home Remedies for Nail Fungus? Is It Possible to Prevent a Fungal Nail Infection? What Types of Specialists Treat Fungal Nail Infections? What Is the Prognosis of a Fungal Nail Infection? Fungal infection of the toenails or fingernails is caused by a fungal microbe that invades the nail bed. Fungal nail infection is also termed onychomycosis and tinea unguium. Fungal nail infection causes fingernails or toenails to thicken, discolor, disfigure, and split. At first, onychomycosis appears to be only a cosmetic concern. Without treatment, however, the toenails can become so thick that they press against the inside of the shoes, causing pressure, irritation, and pain. Fingernail infection may cause psychological, social, or employment-related problems. Half of all nail disorders are caused by onychomycosis, and it is the most common nail disease in adults. Toenails are much more likely to be infected than fingernails. The incidence of onychomycosis has been increasing and is associated with diabetes, a suppressed immune system, and increasing age. Adults, especially the elderly, are more likely to have onychomycosis than children. People with fungal nail infection may have a combination of these subtypes. Total dystrophic onychomycosis is the term used to refer to the most advanced form of any subtype. 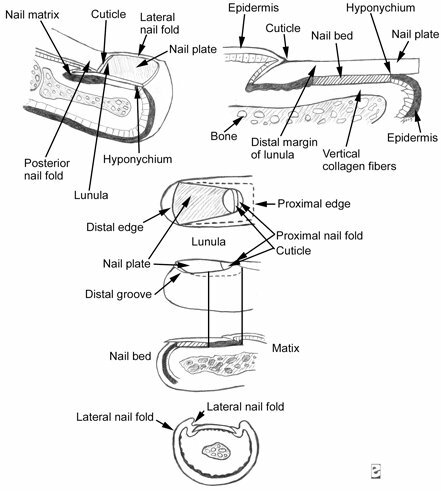 The nail matrix (where the nail starts) is where nail cells multiply and keratinize (harden and form into nail material) before being incorporated into the fingernail or toenail. Most of the matrix is not visible. The matrix starts under the skin 5 mm below the nail fold (the area of the cuticle where the finger or toe skin meets the nail) and covers the area called the lunula, or half moon (the white half moon-shaped area at the bottom of the nail). The cuticle is a fold of modified skin where the finger or toe meets the nail. The cuticle protects the matrix from infection. The nail plate is the nail itself. The nail bed is the soft tissue underneath the nail, anchoring the nail plate. The nail plate protects the nail bed. Fungal nail infection is divided into clinical subtypes based on the cause and progress of the infection. Distal lateral subungual onychomycosis (DLSO) is the most common form of fungal nail infection. In DLSO, the fungus generally spreads from the skin and invades the underside of the nail where the nail meets the nail bed. Inflammation in these areas of the nail causes the symptoms of DLSO. White superficial onychomycosis (WSO) is a rare infection caused by the fungi directly invading the surface of the nail plate and secondarily infecting the nail bed. In proximal subungual onychomycosis (PSO), the least common subtype, the fungi invade the cuticle (the skin around the nail) and the nail fold and then penetrate the nail plate (fingernail or toenail). Like DLSO, in endonyx onychomycosis (EO), the fungi reach the nail via the skin. Instead of infecting the nail bed, however, the fungi immediately invade the nail plate. Onycholysis describes the nail separating from the nail bed. Chronic mucocutaneous disease (disease of mucous membrane and regular skin) involves the nail plate (fingernail or toenail) and eventually the nail fold (the skin fold behind the cuticle, where the nail meets the finger or toe). Total dystrophic onychomycosis is not a distinct subtype of fungal nail infection. Dystrophic onychomycosis is the term used to describe the most advanced form of any of the above subtypes, and it involves the entire nail unit. Dystrophic onychomycosis may cause permanent scarring of the nail matrix. Fungal nail infection is caused by three main classes of organisms: fungi that infect hair, skin, and nails and feed on nail tissue (dermatophytes), yeasts, and non-dermatophyte molds. All three classes cause the very similar early and chronic symptoms or appearances, so the visual appearance of the infection may not reveal which class is responsible for the infection. Dermatophytes (including Epidermophyton, Microsporum, and Trichophyton species) are, by far, the most common causes of fungal nail infection worldwide. Yeasts cause 8% of infections, and non-dermatophyte molds cause 2% of fungal nail infections. The dermatophyte Trichophyton rubrum is the most common fungus causing distal lateral subungual onychomycosis (DLSO) and proximal subungual onychomycosis (PSO). The dermatophyte Trichophyton mentagrophytes commonly causes white superficial onychomycosis (WSO), and more rarely, WSO can be caused by species of non-dermatophyte molds. The yeast Candida albicans is the most common cause of chronic mucocutaneous candidiasis (disease of mucous membrane and regular skin) of the nail. Risk factors for fungal nail infection include family history, advancing age, poor health, trauma, living in a warm climate, participation in fitness activities, immunosuppression (can occur from HIV or certain drugs), bathing in communal showers (such as at a gym), and wearing shoes that cover the toes completely and don't let in any airflow. Fungal nail infections, especially toenail infections, can be contagious person to person from direct and indirect contact with an infected person or their clothing, such as wearing an infected person's shoes or socks. The incubation period for a fungal nail infection is about three to six days. Paresthesia (a sensation of pricking, tingling, or creeping on the skin having no objective cause and usually associated with injury or irritation of a nerve), pain, discomfort, and loss of agility (dexterity) may occur as the disease progresses. Loss of self-esteem, embarrassment, and social problems can also develop. Fungal nail infection is divided into subtypes that can be identified based on where the infection appears to be located relative to the structure of the nail. In distal lateral subungual onychomycosis (DLSO), the nail plate is thick with a cloudy appearance (opaque), the nail bed underneath the nail thickens (becomes raised) and hardens (nail bed hyperkeratosis), and the nail separates from the bed underneath (onycholysis). The nail can be discolored and appear in a range from white to brown. The edge of the nail becomes severely eroded (ragged and brittle) and may become flaky (peeling). In endonyx onychomycosis (EO), the nail plate has a milky white discoloration, but unlike DLSO, the nail does not separate from the bed (no onycholysis). The area under the nail (subungual area) does not thicken or harden (no hyperkeratosis). White superficial onychomycosis (WSO) is usually confined to the toenails. Small white speckled or powdery-looking patches appear on the surface of the nail plate. The nail becomes rough and crumbles easily (crumbly nails). In proximal subungual onychomycosis (PSO), an area of white spotting, streaking, or discoloration (leukonychia) develops near the nail fold and may extend to deeper layers of the nail. The nail plate becomes white near the cuticle and remains normal at the end. In total dystrophic onychomycosis, the nail is thickened, opaque, and yellow-brown and/or greenish-brown to black. The entire nail plate and matrix are affected. Yeast infection (Candida albicans), while affecting the nail, can appear with additional signs. Candidal infection can occur in the toenails and the fingernails but may also infect the tissue that surrounds the nail. The nail fold becomes inflamed (erythematous), or the nail plate separates from its bed (onycholysis). The nail bed thickens and hardens (nail bed hyperkeratosis), and inflammation of the nail fold is observed in chronic mucocutaneous disease (disease of mucous membrane and regular skin). The affected fingers or toes start to look rounded on the ends, like drumsticks, and, sometimes, the entire thickness of the nail becomes infected. Some fungal infections may be associated with an odor described as a slightly foul odor or a "cheesy" odor. This odor may be due to chemicals (S-methyl thioesters) produced by bacteria that can colonize fungal-infected and other warm, damp areas. Picture of fungal nail infection on the big toes; SOURCE: CDC/Dr. Edwin P. Ewing, Jr.
Fungal nail infection can be identified by its appearance. However, other conditions and infections can cause problems in the nails that look like fungal nail infection. Fungal nail infection must be confirmed by laboratory tests before beginning treatment, because treatment is long, expensive, and does have some risks. A sample of the nail can be examined under a microscope to detect fungi. The nails must be clipped and cleaned with an alcohol swab to remove bacteria and dirt so the fungal structures can be more easily visualized with a microscope. If the doctor suspects distal lateral subungual onychomycosis (DLSO), a sample (specimen) should be taken from the nail bed to be examined. The sample should be taken from a site closest to the cuticle, where the concentration of fungi is the greatest. If proximal subungual onychomycosis (PSO) is suspected, the sample is taken from the underlying nail bed close to the lunula. A piece of the nail surface is taken for examination if white superficial onychomycosis (WSO) is suspected. To detect candidal fungal nail infection, the doctor should take a sample from the affected nail bed edges closest to the cuticle and sides of the nail. In the laboratory, the sample may be treated with a solution made from 20% potassium hydroxide (KOH) to help rule out or more easily verify the presence of fungi by reducing debris and human tissue in the sample. The specimen may also be treated with dyes (a process called staining) to make it easier to see the fungal structure through the microscope that help identify the precise species of the pathogen. If fungi are present in the infected nail, they can be seen through a microscope, but the exact type (species) cannot be determined by simply looking through a microscope. To identify what exactly is causing fungal nail infection, a fungal culturing is used. Using a fungal culture to identify the particular fungus is important because regular therapy may not work on non-dermatophyte molds. The infected nail is scraped or clipped. The scrapings or clippings are crushed and put into containers. Any fungus in the samples can grow in the laboratory in these special containers. This is true for most molds and yeast also. The species of pathogen (usually a fungus) can be identified from the cultures grown in the lab by technicians trained to recognize the microscopic structures that are identifiers of the fungal species. In the past, medicines used to treat fungal nail infection were minimally effective. Fungal nail infection is difficult to treat because nails grow slowly and receive very little blood supply. However, recent advances in treatment options, including oral (taken by mouth) and topical (applied on the skin or nail surface) medications, have been made. Newer oral medicines have improved treatment of fungal nail infection. However, the rate of recurrence is high, even with newer medicines. Treatment has certain risks, and recurrence is possible. Topical antifungals are medicines applied to the skin and nail area that kill fungi and some other pathogens. These topical agents should only be used if less than half the nail is involved or if the person with fungal nail infection cannot take the oral medicines. Medicines include amorolfine (Curanail, Loceryl, Omicur), which is approved for use outside the United States, ciclopirox olamine (Penlac, which is applied like nail polish), efinaconazole (Jublia), sodium pyrithione, bifonazole/urea (available outside the United States), propylene glycol-urea-lactic acid, ketoconazole (Nizoral cream, Xolegel), such as terbinafine (Lamisil cream), tavaborole 5% solution (Kerydin), toliaftate (Tinactin), naftifine (Naftin), butenafine (Lotrimin), griseofulvin (Gris-PEG), ciclopirox (Ciclodan), miconazole (Zeasorb), clotrimazole and tioconazole. Topical treatments are limited because they cannot penetrate the nail deeply enough, so they are generally unable to cure fungal nail infection. Topical medicines may be useful as additional therapy in combination with oral medicines. This results in treatment medicine concentrations that come from two directions, topically and from within the body via oral medicine. Newer oral prescription medicines are available. These antifungal medicines are more effective because they go through the body to penetrate the nail plate within days of starting therapy. Newer oral antifungal drugs terbinafine (Lamisil tablets), fluconazole (Diflucan), and itraconazole (Sporanox capsules) have replaced older therapies, such as griseofulvin, in the treatment of fungal nail infection. They offer shorter treatment periods (oral antifungal medications usually are administered over a three-month period), higher cure rates, and fewer side effects. These medications are fairly safe, with few contraindications (conditions that make taking the medicine inadvisable), but they should not be taken by patients with liver disease or heart failure. Before prescribing one of these medications, doctors often order a blood test to make sure the liver is functioning properly. Common side effects include nausea and stomach pain. Fluconazole (Diflucan) is not approved by the Food and Drug Administration (FDA) for treatment of fungal nail infection, but it may be used by some clinicians as an alternative to itraconazole and terbinafine. To decrease the side effects and duration of oral therapy, topical and surgical treatments (see below) may be combined with oral antifungal management. Surgical approaches to fungal nail infection treatment include surgically or chemically removing the nail (nail avulsion or matrixectomy). Thick nails may be chemically removed by using a urea compound. This technique usually should be deferred to a surgeon or dermatologist. Surgically removing the nail plate (fingernail or toenail) is not effective treatment of fungal nail infection without additional therapy. This procedure should be considered an adjunctive (additional) treatment combined with oral medical therapy. A combination of oral, topical, and surgical therapy may increase the effectiveness of treatment and reduce the cost of ongoing treatments. One of the newest treatments to kill pathogens infecting the nails is laser therapy. The laser beam can penetrate the nail tissue and disrupt fungal and other pathogens enough to kill them. Some patients may experience some mild discomfort or pain during the procedure. Reports suggest that laser therapy is about as effective as medical therapy. Some patients may require more than one treatment. This treatment can be very expensive, and the cure rate is poor. Over-the-counter (OTC) products such as Listerine (foot soaks in Listerine), Vicks VapoRub, beer foot soaks, hydrogen peroxide, and others are purported to be effective in some individuals. Home remedies are numerous; tea tree oil, coconut oil (mixed with other essential oils like tea tree), baking soda, white vinegar, garlic, orange oil, and lavender oil are only a few of the home remedies. Unfortunately, there is little or no data to support these claims. Some of the commercially available or over-the-counter products do not promote their use for nail infections, although some individuals may use them for alternative treatments. These should be avoided. Remember that nail infections can be passed from person to person so washing hands (and feet) after contacting another person with nail infections is a good practice. Do not go barefoot in public showers or locker rooms. Use antifungal spray or powder in shoes, especially gym shoes. Be sure that if a manicure or pedicure is done, instruments are sterilized before each person is exposed to them. Keep feet dry and clean as possible. Keep finger and toe nails trimmed; do not pick at or chew on fingernails or the skin around them. Avoid caustic skin agents by wearing protective gloves. Socks that wick away sweat help reduce moisture that can promote the survival and growth of nail pathogens. Fungal nail infections are often treated by a person's primary-care doctor. Other specialists who may treat these infections include dermatologists, podiatrists, and infectious-disease doctors. Several studies with the newer drugs (itraconazole or fluconazole) show significant cure rates, with fingernails having the most favorable prognosis. A cure may occur in some individuals with toenail infections after consistent lengthy treatments over many months. Unfortunately, most people will have some complications such as residual nail changes or some discoloring, and about half will experience nail reinfection. Regrowth of toenails may take over a year to occur. A yeast infection results from an overgrowth of yeast (a type of fungus) anywhere in the body. Candidiasis is by far the most common type of yeast infection. There are more than 20 species of Candida, the most common being Candida albicans. These fungi live on all surfaces of our bodies. Under certain conditions, they can become so numerous they cause infections, particularly in warm and moist areas. Examples of such infections are vaginal yeast infections, thrush (infection of tissues of the oral cavity), skin, including diaper rash, beneath large breasts, and nailbed infections. Onumah, Neh. "Nail Surgery." Medscape.com. Jan. 25, 2012. <http://emedicine.medscape.com/article/1126725-overview>. Tosti, Antonella. "Onychomycosis." Medscape.com. Jan. 21, 2015. <http://emedicine.medscape.com/article/1105828-overview>. What effective treatments have you found for fungal nail infections? What are the symptoms and signs of your fungal nail infection?